Steve Houghton, guest clinician for the 13th annual Jazz Festival at Missouri Western Feb. 7. 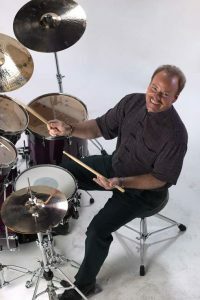 The Department of Music at Missouri Western State University will host the 13th annual MWSU/Phi Mu Alpha Jazz Festival Thursday, Feb. 7, featuring internationally known percussionist Steve Houghton as the guest clinician. The festival is free and open to the public. Beginning at 7:30 a.m., school groups will be performing in Blum 219 and the Fulkerson Center. Each ensemble performs for the adjudicators, receiving recorded and written critiques of the performance from the clinicians. Immediately following each band’s performance the clinicians will give a 25-40 minute clinic for the band, discussing and working on specific areas of the performance. Local ensembles that will be performing are Benton and Central High Schools of the St. Joseph School District. Clinicians for this year are Jim Mair, director of jazz studies, Kansas City, Kansas, Community College; David Aaberg, director of jazz studies, University of Central Missouri; Steve Molloy, trumpet instructor, Missouri Western; and Kathleen Holeman, director of vocal jazz, Missouri Western. Guest artist Steve Houghton will present a clinic at 11:30 in the Fulkerson Center that will be open to the public. The festival will conclude with a short concert by the Missouri Western Jazz Ensemble and Steve Houghton, directed by Bob Long, at 5:45 p.m. in the Fulkerson Center. For more information please contact the Music Department at 816-271-4420, or long@missouriwestern.edu.